The only requirements are that you be at least 18 years old, have a major credit card and a valid driver's license. If you meet these requirements, you can be having the time of your life in no time, thanks to our fast and easy rental application procedures. Please download, fill out and bring this Contract with you. It will save you time. Included in your rental is basic safety equipment that is required including a life vest. You'll need to tow your jet ski up to the lake. All units are fast and tough. We know you like your sports extreme. Our equipment is durable. It has to be to keep up with the playful, adventurous spirit that is at the heart of the American identity. 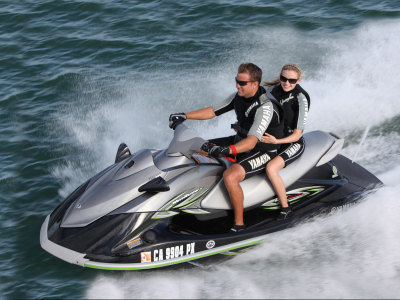 The rental rate for a Yamaha VX 110 110H.P, 3 Seater Waverunner is from $200 per day, plus a $400 Security Deposit.